After setting up payment plans, you can start using them to help students pay their invoices. Student: At this level, the plan can be used for all of the student's plan-eligible invoices. These are set up on Profile > Financial > Dashboard. Term: Plans on the term level can be used for the student's invoices falling in a particular term. These are set up on Profile > Financial > By Term. You can also add either of the above to a group of students using the Data Slicer. Invoice: You can also apply a plan to an individual invoice, which covers that invoice and nothing more. These are set up on the invoice's page. You add the plan to a student on Profile > Financial (or a group of students using the Data Slicer). You add the plan to a specific invoice on the invoice page. 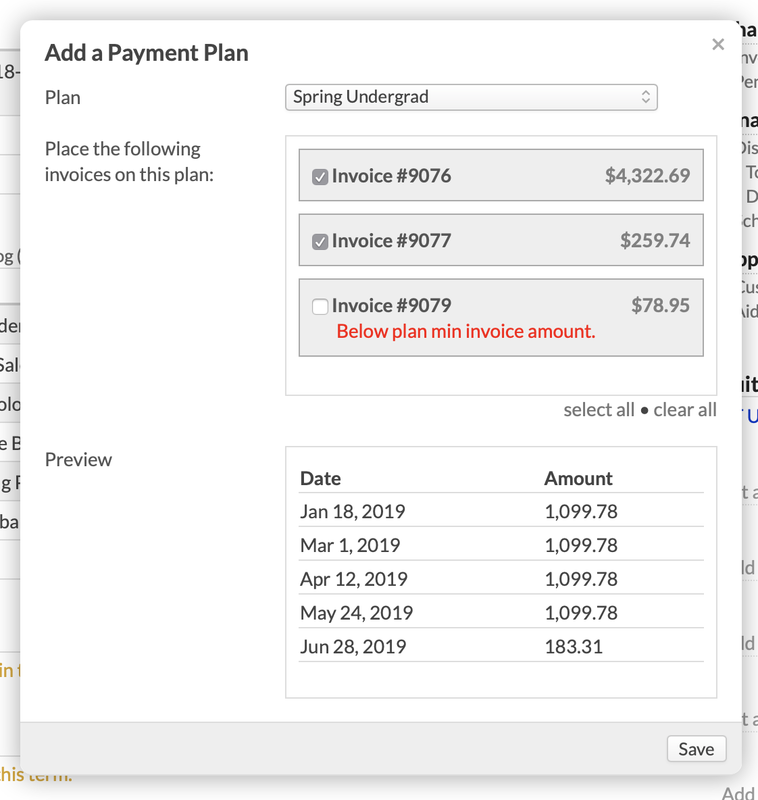 Stripe customers: If you've enabled the Online setting for a particular plan, students can choose it when they go to pay their invoices on the online payment page. You can add a payment plan to a student on Profile > Financial—either on Dashboard or By Term. On either of the two views, click Add a payment plan. On Dashboard, it's just below the summary. On By Term, it's at the bottom of the right column. Pick the plan from the drop-down (on Dashboard, you cannot pick plans based on the number of days into the term). Check the invoices (if any) you'd like this plan to cover. If there are no invoices, they'll automatically be added to the plan as they are posted. Plans added on Dashboard can pick up all of the student's plan-eligible invoices. Plans added on By Term can pick up only those invoices connected to this term. The payment schedule will display in the payment plan panel. Due dates for affected invoices will be changed to the Balance Due date from the plan. 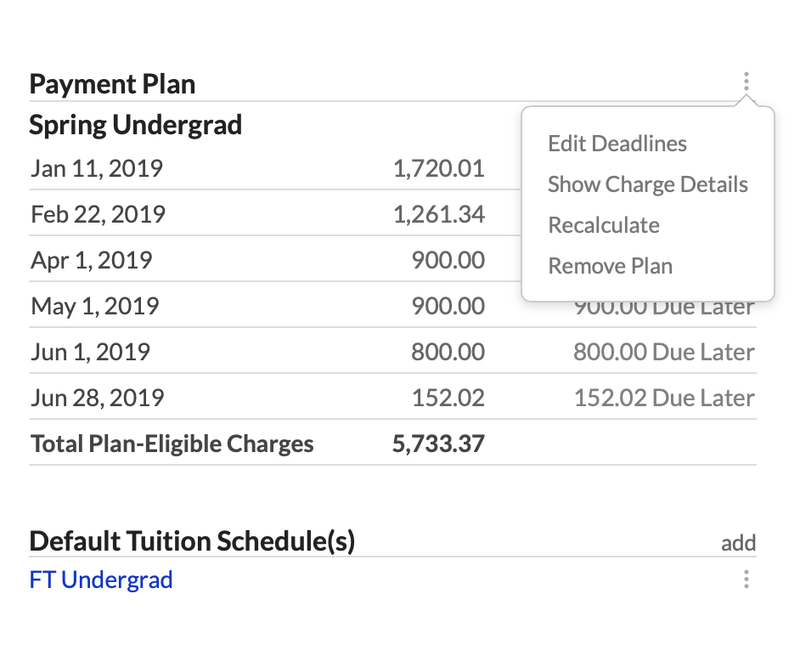 The plan's payment dates will display on the student's Financial > Dashboard > Summary. If there is a fee for the plan, it will appear as a Pending Fee in the appropriate view on Profile > Financial. You can add payment plans to groups of students on the Data Slicer. It only applies plans to students who do not already have a payment plan at the level you select in this workflow. For example, if your report returns 100 students and 10 of them already have a Student- level plan, any such plan will only be applied to the remaining 90 students. Go to Academics > Reporting > Data Slicer. Using the Filter tool, create a report. Click Actions and select Apply Payment Plan. Choose the level—Student-level plans pick up all of a student's eligible invoices; Term-level plans pick up invoices from the term you select. Choose the plan from the drop-down. When you're ready, click Save. On invoice pages, you can apply a payment plan to just that invoice. You can also exclude the invoice from inclusion in any payment plan. Go to the invoice page. In the right column, click add next to Payment Plan. Select the payment plan from the drop-down. If you wish to exclude this invoice from all payment plans, check the Do not allow... box. If this invoice is already on a payment plan applied elsewhere, it will remove it from that plan and place it on the one you choose here. The payment schedule for that invoice will display in the left column. The invoice's due date will be changed to the Balance Due date from the plan. The total amount of all the invoices will be divided among the plan's installments. When you apply a payment or credit, it will reduce the amount due on the student's next payment. However, it will be applied to the oldest invoice (reckoned by posting date) included in the plan. If the Subtract Scheduled Aid... setting is checked, then you'll see that reflected in the plan calculations. If it is not, you will not see how the aid affects the payments until it is disbursed. After a student has been placed on a payment plan, you can edit almost any aspect of that plan for that student. Keep in mind that editing the payment plan in Billing > Settings will not affect any students who are already on that plan! Go to her Profile > Financial view and find the plan you'd like to edit on either Dashboard or By Term. Edit deadlines: You can change the dates or amounts for any payment, add new deadlines, or delete an existing deadline. Show charge details: See a detailed list of the individual charges on the invoices included in the plan. Recalculate: This divides the current balance of the plan's invoices among the plan's installments. It erases any manual changes (dates, amounts, new deadlines, etc.) you have made up to this point. Remove plan: Deletes the payment plan from this student at this level. When you do this, any invoices on the plan will be returned to their original due dates. Adding: As you post new invoices, they'll automatically be added to the student's payment plan at the appropriate level. 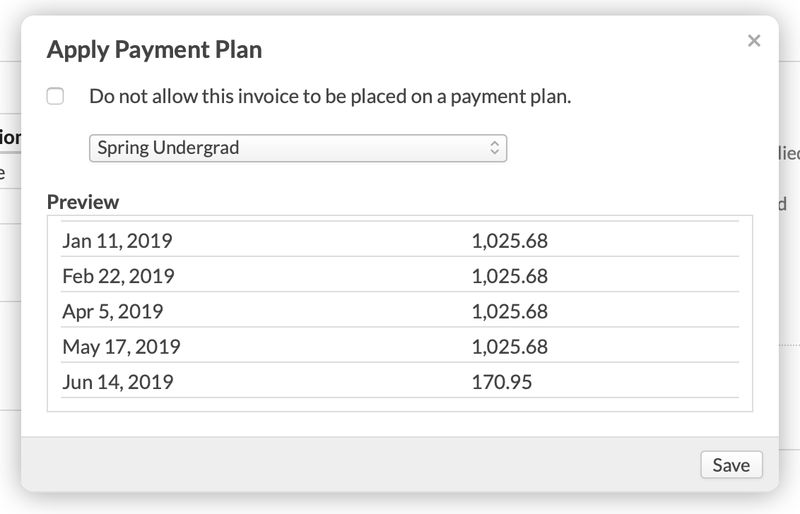 For example, if a student has a term-level plan, any new invoices you post for the student in that term will automatically be added to the plan. If the student has a student-level plan, it will capture all new invoices you post, whether on Dashboard or By Term. Go to the invoice's page. Under details, click edit next to the Payment Plan. In the dialog, select None to take the invoice off the plan. You can also select a different payment plan, or check to keep the invoice off all payment plans. 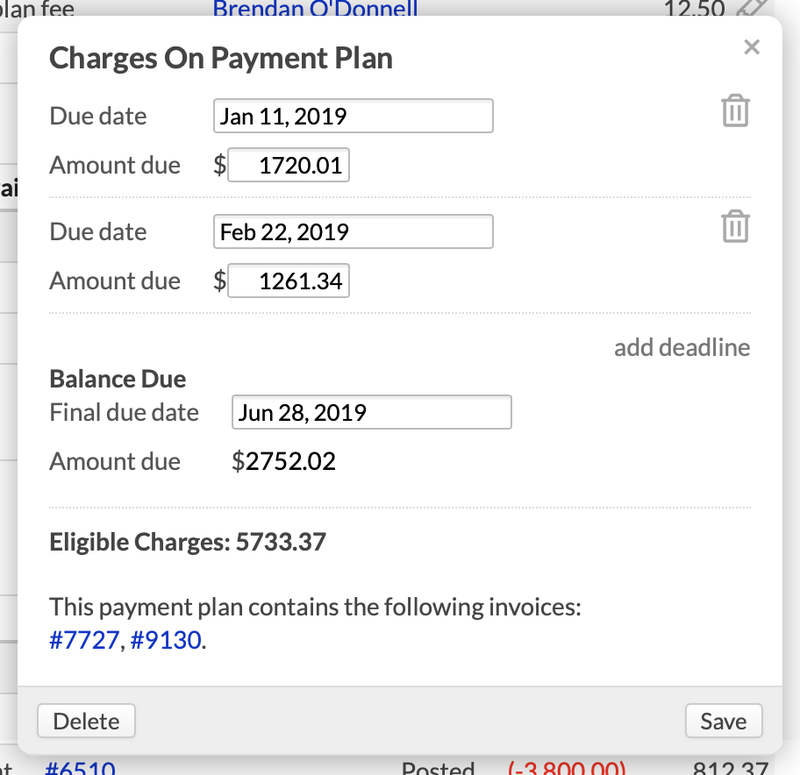 The Payment Deadlines report in Billing > Current shows all due dates for all payments (past, present, and future)—for both payment plans and individual invoices. Use the filter to focus the report on particular kinds of invoices. You can also Email the students and Export a report of the deadlines.